Imagine having email campaigns that trigger automatically — based on how someone interacts with your company and your website. And that’s just the automated side of things. Then you’ve got the manual side of things… and while it might be manual, it’s no less important than the automated side. … there’s a lot of money to be found. It can be simple, such as sending an email to people who abandon their shopping carts. Or complex, like having numerous campaigns that work together synergistically to multiply sales exponentially. At the end of the day, when you look behind the promotions, offers, free shipping coupons and lead nurturing emails —email marketing is about building relationships. You’ll create better promotions that sell more product. You’ll nurture your subscribers better, which will lead to more long term sales. You’ll segment your database more effectively, which will (once again)generate more sales. Email marketing isn’t about blasting the crap out of your database any more than sales is about cold-calling people and screaming through the phone at them. First, let’s take a look at your tools, because like any good craftsman, we need the right tools. When we get into the campaigns section, you’ll see specific examples of each type of email. Before we do that though, let’s dive into the pieces of the perfect ecommerce email. Now, some companies like to get all fancy by using a personal name in the “From” field. They do this because they think it’s going to get them attention. However, in our experience, if your brand doesn’t revolve around like a specific person, like Oprah or Dr Phil, you’re better off using your brand or company name, just like the example above. This is where I see a lot of otherwise smart companies make a silly mistake. Make it easy for people to contact you by using an email address that they can send emails to, such as hello@google.com. You’ll look more approachable, you’ll get more customer feedback, and you’ll be more successful as a result. Plus, by using an email address people can actually reply to, you can ask people to reply to your emails in your various campaigns (which we’ll get to in just a moment). In other words, of everything listed above, spend most of your time focused on your subject line. 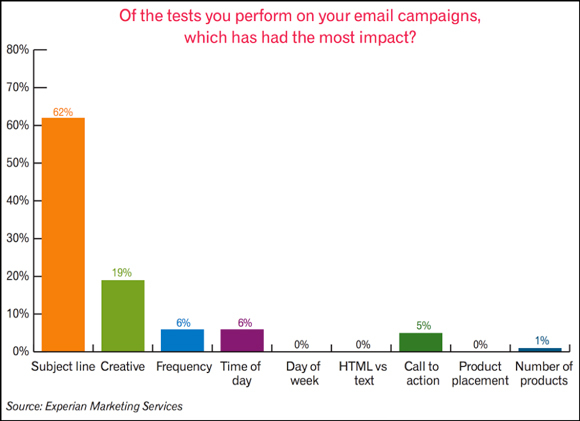 …Employ best practices, and invest your creative juices coming up with compelling subject lines and testing them. Because that’s where you’ll get the most bang for your buck. Litmus, an email marketing tool, discovered you have only 4 seconds to capture someone’s attention and get them to open and read your email. So when you’ve written your subject line, study it carefully and see if it gets you hooked in 4 seconds. Ideally, you should get that down to 1 second. Great marketing is about pattern interrupts, but if you’re doing the same thing as everyone else, you’ll blend into the furniture and no one will pay attention. Instead, personalize with their city name. MailChimp research suggests it works even better. Most newsletters and email campaigns begin with high open rates, and then decline over time. To mitigate this happening, don’t re-use subject lines, and don’t make your subject lines too similar to each other. Remember, great marketing is about interrupting someone’s pattern, and to do that, you need to keep it fresh. As a general rule of thumb, stick to 50 characters or less. Since most people scan their inbox, make it easy on them when figuring out whether to open your email. If you absolutely must have a longer subject line, make sure that the first 50 characters are the juiciest part. Don’t save the punchline for the end of the subject line because most people will miss it. and go easy on the exclamation marks. Have You Tried Asking Questions? The first time you trick a subscriber into opening your email by using a misleading email, they’ll be annoyed at you. The second time, they’ll ignore you. Be honest and direct about what your email contains, while also being compelling. Businesses use urgency (ie. 24 hours left!) because it works, but like any marketing strategy used too often, it loses it’s effectiveness if you over-do it. Use urgency when it makes sense, but don’t come to depend on it. I can’t mention this enough. Test, test, TEST. While I’ve described best practices here for email subject lines that will work for most companies, you’ll need to test, tweak and optimize to find the perfect subject lines that work for your company. Once you have your subject line written, use a free rating tool likeSubjectLine.com to evaluate your subject line. Alright. That’s it for subject lines. We could talk about subject lines all day, but we have to get moving. The pre-header text is the text that appears in your email next to your subject line. It’s what people see after they’ve read the subject line, and plays a role in determining whether they’ll open the email, so you want to get it right. Think about your pre-header text as a continuation of your subject line. Use it to expand on your subject line, and dial up the curiosity and emotion that is already associated with the subject line. 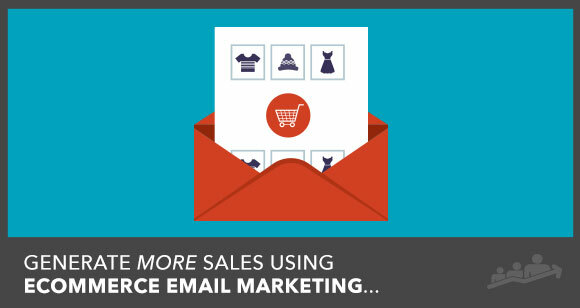 Generally speaking, when it comes to eCommerce email marketing, less is more. Less images. Less fancy design elements. Less “pizazz”. If your email is 100% text with no branding elements whatsoever, it will probably get marked as spam because people won’t know immediately who the email is from (this happened to a campaign we sent a few months back). If you go too heavy on the fancy design elements – like beautiful images, animated GIFs, and crazy layouts – your email is more likely to be picked up by email algorithms and sent to the promotions tab or folder. As with design, keep the copy simple and to the point. Avoid being clever or cutesy. Be clear and concise. 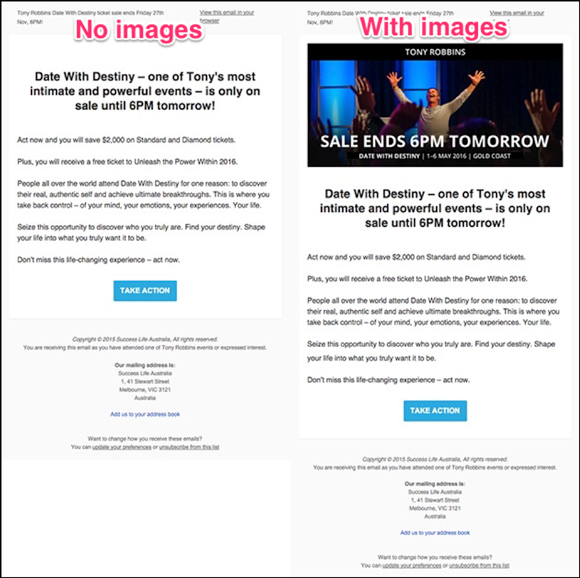 The magic of many of the campaigns we’ll be discussing below is due to the timing and behavioural nature of the emails, not a result of having the best copy. Despite what some companies will tell you, or what you probably want to believe, there is no “perfect” time for sending eCommerce emails that works for every company out there. Instead of taking a cookie-cutter approach to timing emails, I encourage you to invest time and energy into thinking carefully about it. Most emails are read within 4 hours of being sent, so think carefully about what people are likely to be doing in the few hours after sending your email. Are they likely to have some free time to read your email in the few hours after you send it? Are they going to be in the mood to buy? Take a look at revenue and orders for time of the day. This will give you an idea of when people like to purchase, and these times will typically work best for sending emails (especially if you time your emails to go out just before buying spikes on a given day). Lastly, hop on over to your competitors’ websites, sign up to their mailing lists, and see when they send their emails. Interestingly, when considering mobile optimization, it pays to keep your emails simple. The simpler the content, the easier is it to design and optimize for mobile display. If images are disabled, does your email still make sense? Who is this email from? What’s it all about? Is this relevant TO ME? This email improves towards the bottom, in the sense that I can read some text and figure out what they want me to do (click a link to view a blog post or ebook). Always send a test email to an account that has images disabled and check to see if it makes any sense at all. If it looks like the WhatCounts email above, update the email so that it makes without the images. Chances are, you already have email marketing software. Most email marketing software isn’t ideal for eCommerce companies — usually because most email marketing software is simple. In other words, using the right email marketing software for your store will go a long way to helping you capture the potential available revenue. 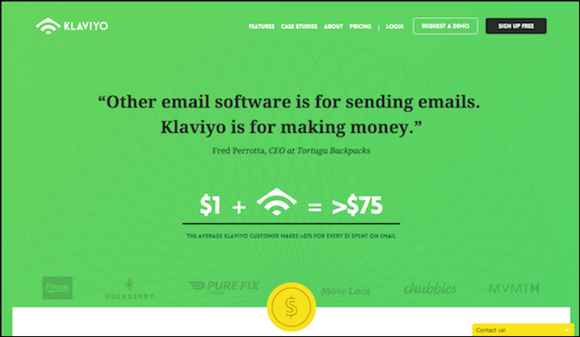 If you don’t have email marketing software yet (or if you’re prepared to switch platforms), use Klaviyo. Klaviyo was designed specifically for eCommerce companies and online retailers, and powers some serious players. It’s what we use for our clients, and recommend to everyone we speak with. Also, I’m not affiliated with the company, and get nothing if you sign up with them (or for mentioning them here). Klaviyo integrates with Shopify, Magento, BigCommerce and all the other platforms. When people buy, you’ll capture their email address. But to send campaigns to people who haven’t bought anything yet, you’ll need to capture their email address before they purchase. You can find other software out there for regular pop-ups, sidebar pop-ups, slider pop-ups, and it’s probably worth testing all of them. However, you’ll tend to get the best mileage from an exit-intent pop-up, since this gives people the space to purchase if they want to — without distracting them with a regular pop-up. 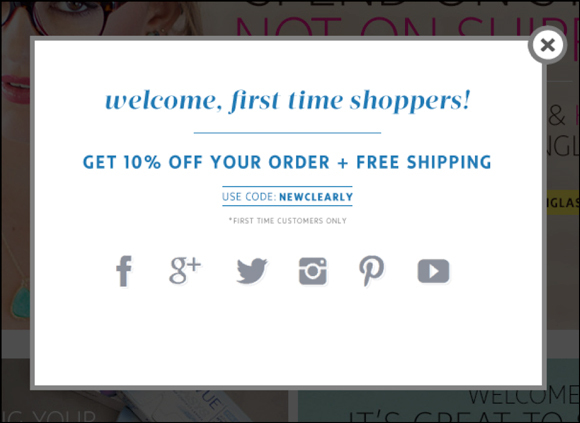 Then, when they go to leave your website, your exit-intent pop-up appears, and makes them an offer. 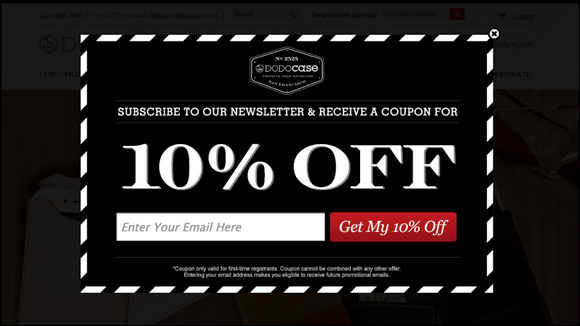 Here’s DODOCASE with their exit-intent pop-up. 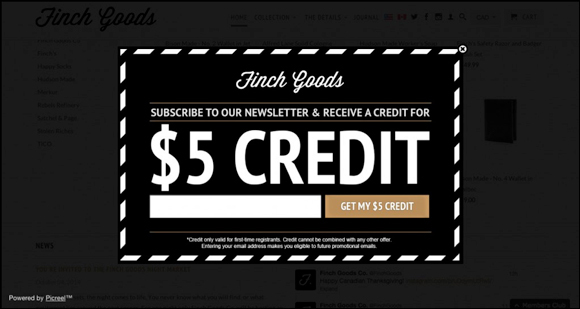 It’s simple, clean, and easy to understand – the key components of all good pop-ups. There’s no way you could be confused by this pop-up. It’s almost identical to the DODOCASE pop-up, except instead of offering a percentage discount, it’s offer a specific cash discount ($5). They could bump their opt-ins here by adding an attention-grabbing image of 5 x one-dollar bills, or 1 x five-dollar bill. While Cloudways isn’t an eCommerce company, this example is still instructive. Instead of offering a discount or credit, Cloudways reminds people of their “double your money back” guarantee. I wanted to include this example, because it highlights the fact that you can make virtually any offer in your pop-up. In an ideal world, you’ll test this on a daily, weekly, or monthly basis, and find the offer that leads to the best revenue over 30-90 days (or similar). Instead of a discount, you could remind people about your guarantee, or offer them free shipping on orders above $40, or refer them to a specific product category, or feature a product that’s HOT right now. In my opinion, this is a poorly designed pop-up. First, they should be collecting emails. Second, they are distracting people from buying by sending them to their social profiles. You’ll see companies doing this a lot. Forsaking email and sending people to Facebook, Twitter and YouTube. So sad.